We decided this morning to visit the most remote National Park in the lower 48 states. 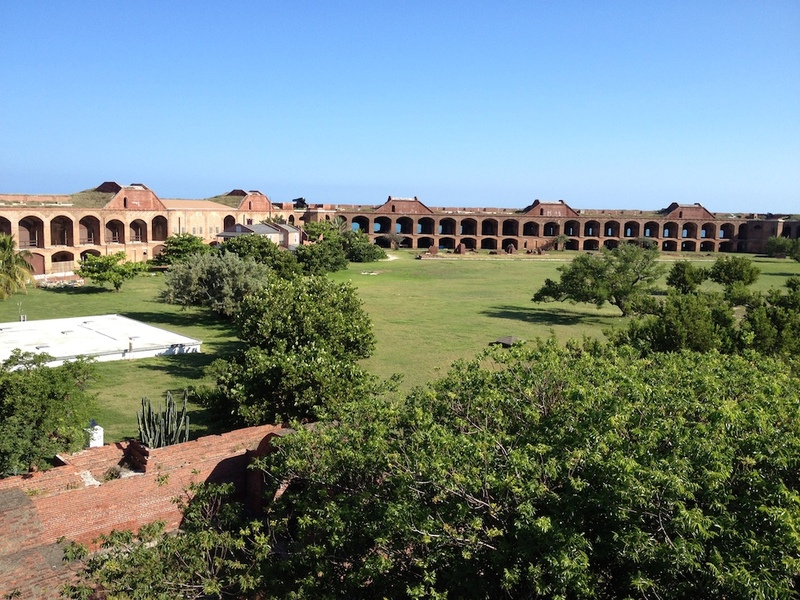 Jeff and I had booked a flight to Fort Jefferson in Dry Tortugas National Park. The Tortugas – Spanish for turtles – are the most distant of the Florida Keys. In fact, you have to fly or take an all-day boat to them because they are not connected to the other Keys by roads. They are closer to Cuba than to Key West. Jeff and I opted for the 40-minute flight to Dry Tortugas. Although it was a pricey four-hour tour for $265, the views were supposed to be spectacular and we didn’t have time for the all-day boat tour. Another added advantage is you almost the entire morning to your before the boat full of passengers arrives. 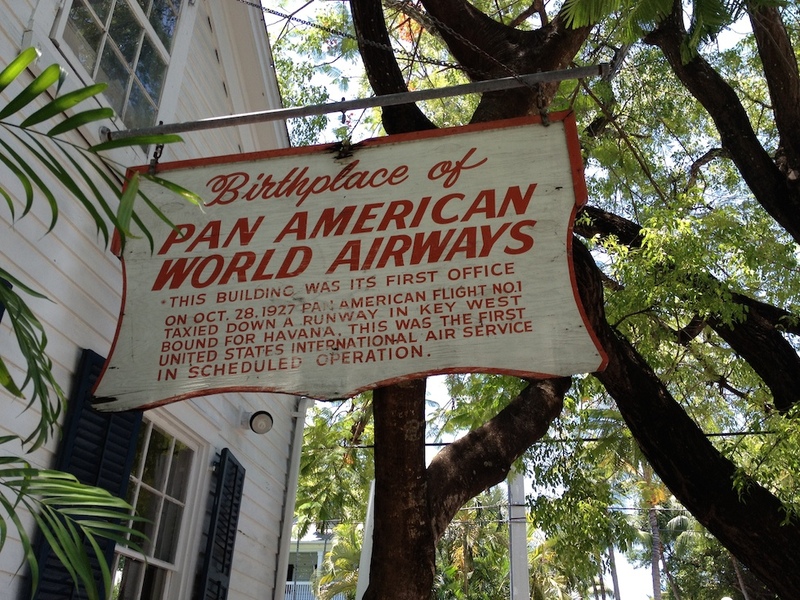 We drove to the Key West airport and checked in for our flight with Key West Seaplane Charters. 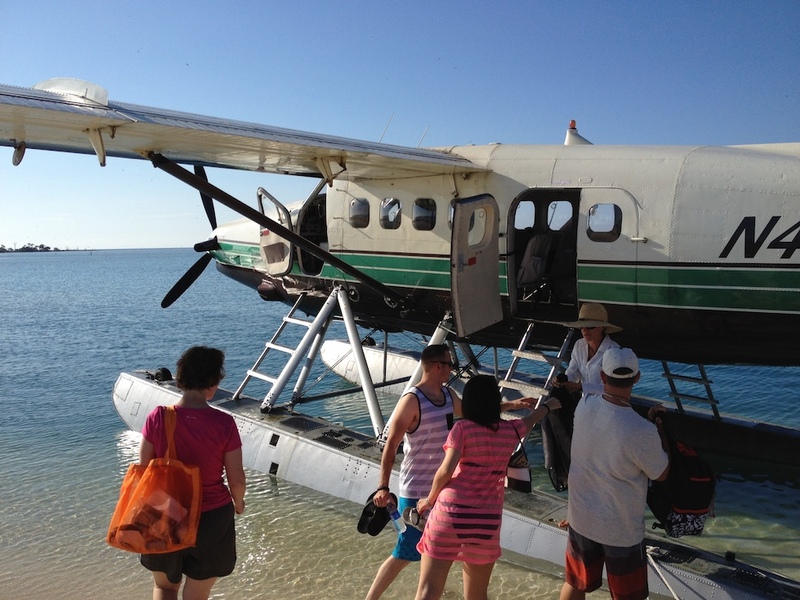 Around 8 a.m., our DHC-3 DeHavilland Turbine Otter took off taking us and eight other passengers toward the Dry Tortugas. On the way out to the Dry Tortugas and Fort Jefferson, our DHC-3 flew at a low altitude of 500 feet which gave us great views of picturesque coral atolls. 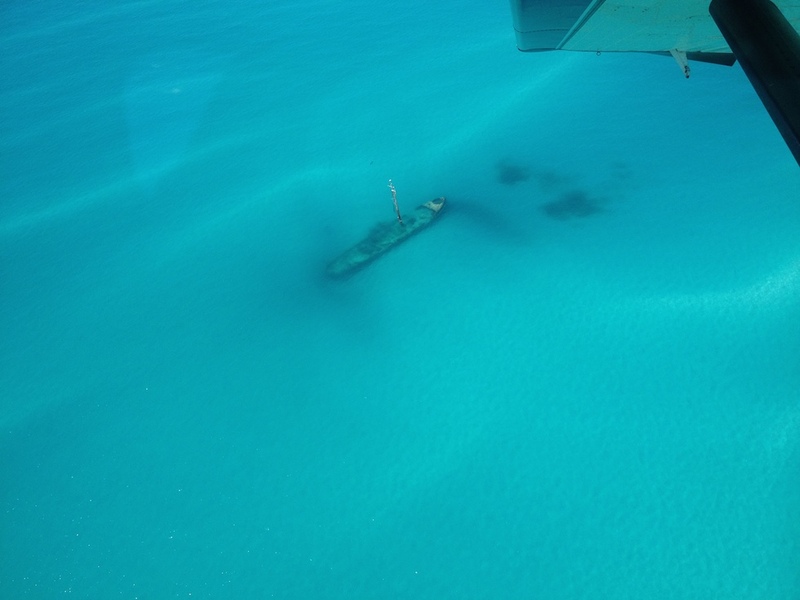 We pass over the Marquesas and the 20-mile stretch of clear shallow water known as Key West’s “flats” area. We saw bull sharks and sea turtles. What was great about the flight was each of us had a window seat and a headset to listen to commentary from the pilot and relaxing music from the Zac Brown Band. Beyond the Marquesas Islands we passed above the Quicksands, an underwater desert of huge sand dunes where the water goes down to 30 feet deep. The dunes continually shift with the strong tidal currents. What is famous about this area is this is where the Spanish Galleons Atocha and Margarita were found. Treasure hunter Mel Fish discovered more than half a billion dollars worth of gold and silver strewn across an eight-mile area. Today adventurers still regularly find huge Spanish emeralds in the Quicksands. 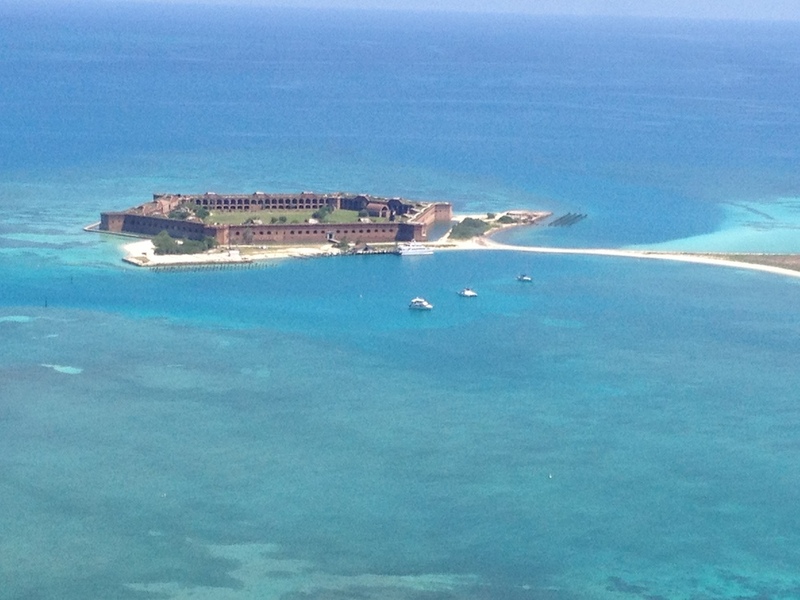 As we arrived at the Dry Tortugas, our pilot made a circular descent around Fort Jefferson which offered a great views of the 150-year old fort. The structure is still the largest brick building in the Western hemisphere. After landing, we spent about 2.5 hours in the Dry Tortugas. 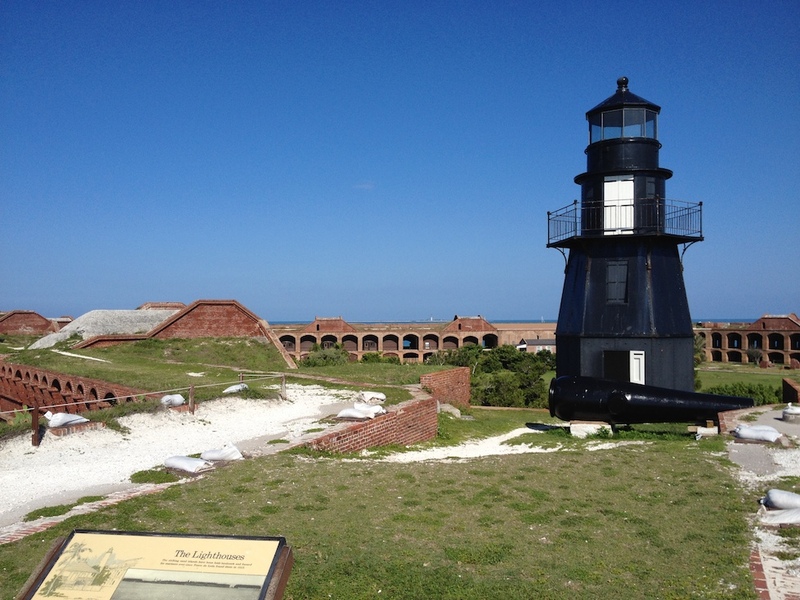 We had a national park ranger give us a brief tour of Fort Jefferson. 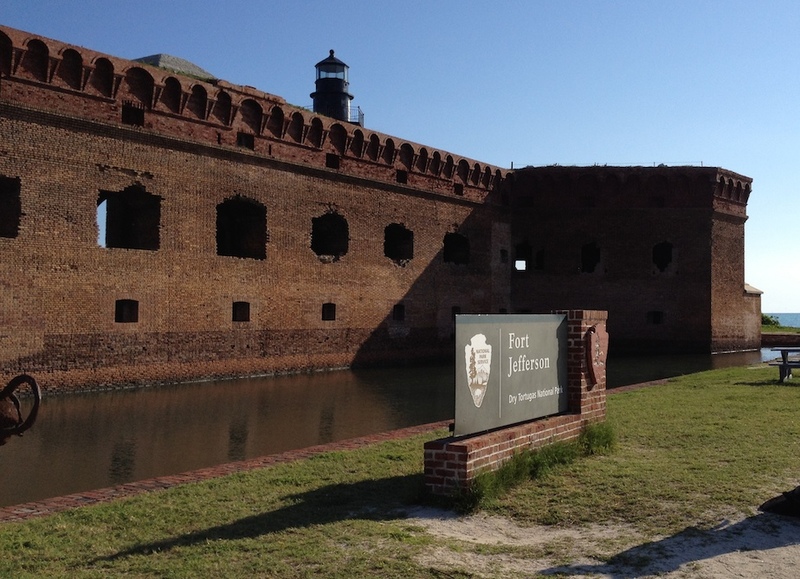 The fort was begun in 1846 and was used extensively during the Civil War and Spanish-American War. During the Civil War, Union warships used the harbor in their campaign to blockade Southern shipping. 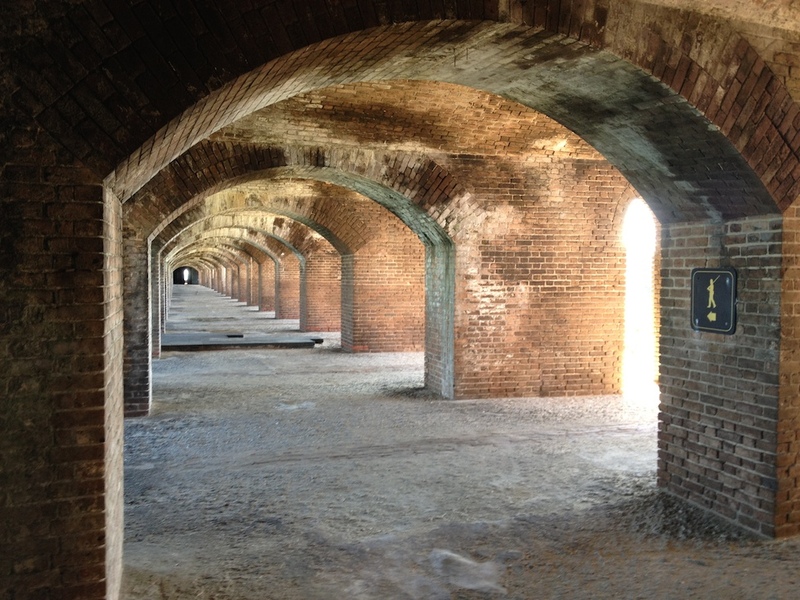 While Florida was part of the Confederacy, Fort Jefferson remained in Union hands. The fort served as a prison, mainly for Union deserters. However, its most famous prisoner was Dr. Samuel Mudd, the physician who set the broken leg of John Wilkes Booth. During the Spanish-American War, the fort was a supply station and the last stop of the U.S.S. Maine before it’s fateful trip to Havana Harbor. Our guide explained that the location of the Tortugas along one the world’s busiest shipping lanes was its greatest military asset. 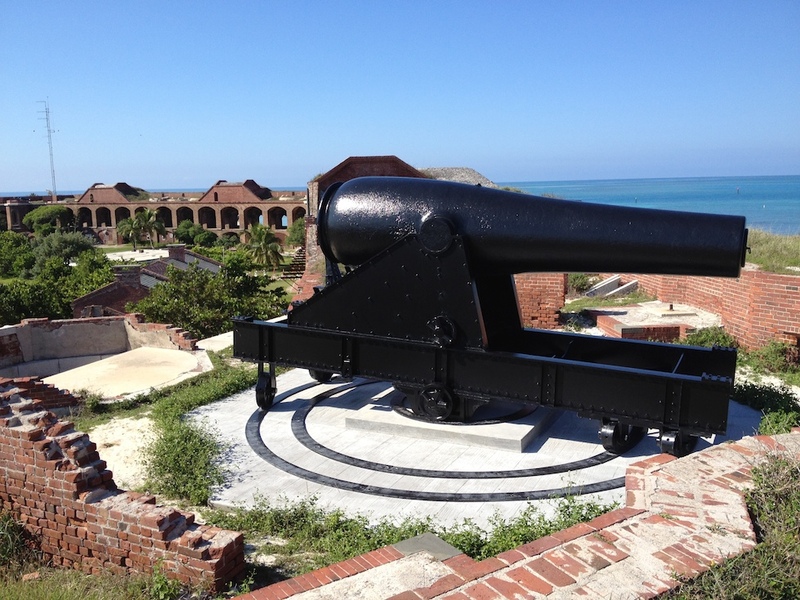 While ships could easily avoid the largest of Fort Jefferson’s guns, they could not avoid the warships that used its harbor. Therefore, it was a very strategic location. The Torgugas are called Dry because there are no natural sources of water on the island. The architects built huge natural cisterns under the brick walls to collect rainwater. Unfortunately, the heavy weight of the bricks and instability of the sand foundation eventually cracked the cisterns so that the salt water of the ocean rolled in. It essentially doomed the strategic worth of the fort. Every year due to the combined weight of the bricks and the rising sea levels, the island is sinking into the Gulf of Mexico. 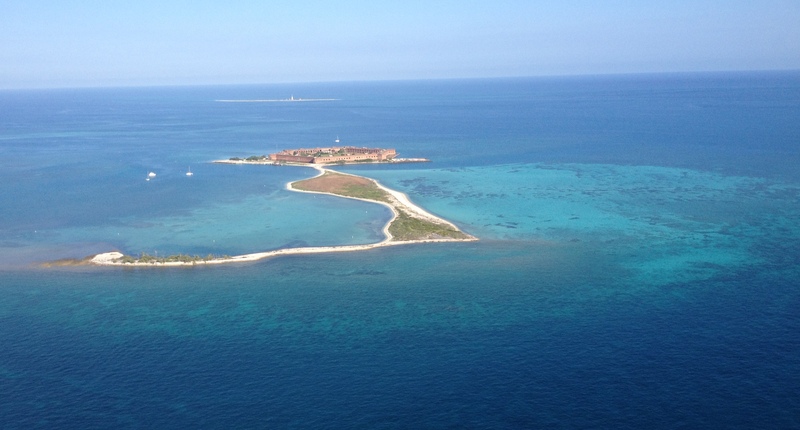 Most people agree that the best Key West snorkeling is actually done on the Dry Tortugas. We decided to snorkel with the free gear that was provided. The white sand beaches were beautiful and peaceful. We also enjoyed free beverages that were brought by our pilot. As the boat of visitors arrived, it was about time for us to leave. We flew back to Key West and arrived about 40 minutes later. After arriving back on Key West, Jeff and I went to eat lunch at the JDL Big Ten Pub. We had some sandwiches and posed with a wooden statue of Captain Morgan. 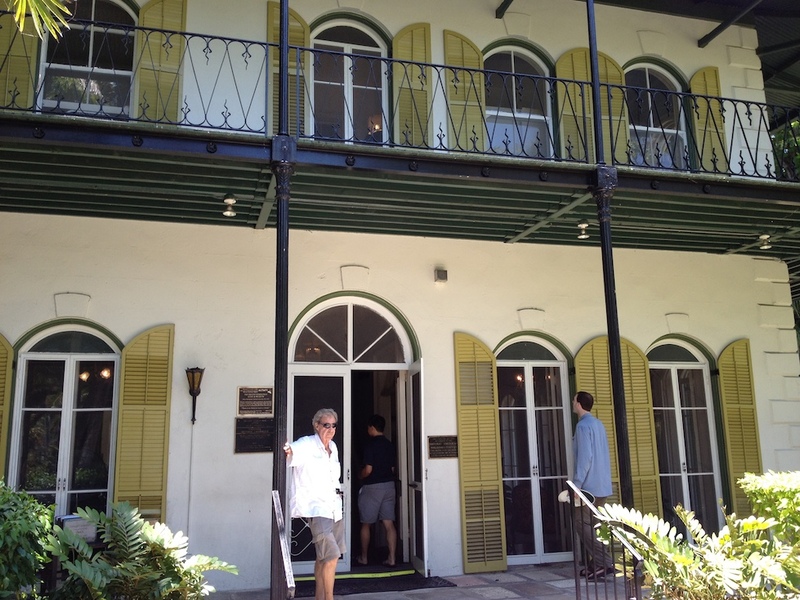 Then we headed to the nearby Hemingway House, a registered National Historic Landmark. The tour costs $13 and includes a 30-minute guided walk through the home. 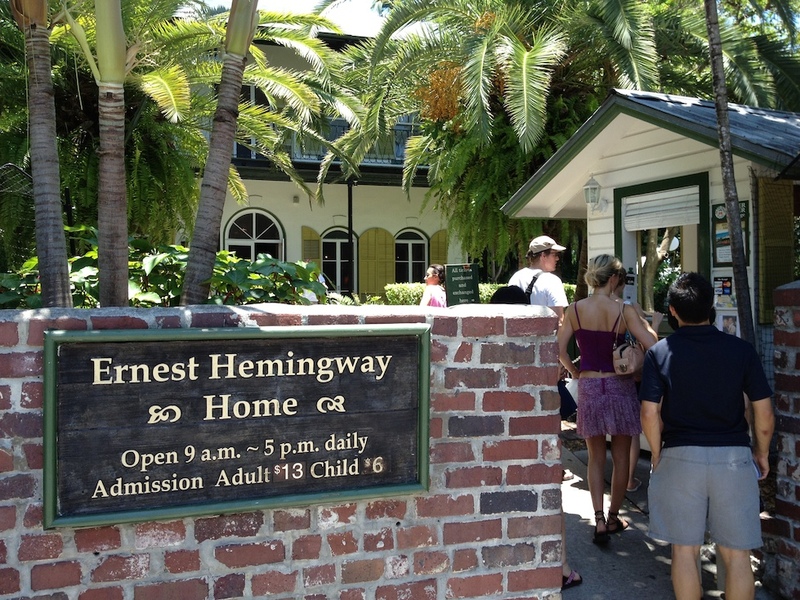 Besides being one of America’s most famous writers, Ernest Hemingway was one of Key West’s most famous residents. For $13, you can tour his house. The Hemingway home was built in 1851 and is one of the greatest homes on the island. Hemingway himself lived there from 1931 until 1939. While residing in the house, he wrote many of his best-known works such as “Death in the Afternoon,” “For Whom the Bell Tolls,” “The Green Hills of Africa,” “The Fifth Column,” “The Snows of Kilimanjaro” and “The Short Happy Life of Francis Macomber” in the second-story writing (adjoining) studio. At the home Hemingway also wrote his only novel set in the U.S. – “To Have and Have Not” – against the setting of a Depression-era Key West. Interestingly enough, following his death in 1961, the unpublished manuscript that was to become “Islands in the Stream” was found in a vault in the property’s garage! One of the most interesting things about the house is the presence of cats. I am not a feline admirer, but an interesting herd of 40 to 50 cats seem to guard the home and grounds. They are descendants of the cats Papa Hemingway owned, but these are strange cats. They are polydactyl – or six-toed cats. Cats normally have five front toes and four back toes. It seems like they are wearing mittens because they appear to have a thumb on their paws! Down the street, we saw the famous Sloppy Joe’s Bar, which is now the venue for Captain Tony’s Saloon. The bar was owned by Hemingway’s good friend and fishing companion Joe Russell, and Hemingway hung out there. Afterwards we visited the Mel Fisher Museum, which hosts some of the treasure of the famous underwater treasure hunter. Fisher and his team discovered the 1622 shipwreck of the Spanish Tierra Firme fleet west of Key West. On September 4, 1622 the Tierra Firme fleet of twenty-eight ships left Havana bound for Spain. Cargo included silver from Peru and Mexico, gold and emeralds from Colombia and pearls from Venezuela. What they didn’t know was there delay leaving meant they were going to sail right into a hurricane the following day. By the morning of September 6th, eight of these vessels lay broken on the ocean floor, scattered from the Marquesas Keys to the Dry Tortugas. The heavily armed Nuestra Señora de Atocha sailed in the rear rear guard and was loaded with 24 tons of silver bullion, 180,00 pesos of silver coins, 582 copper ingots, 125 gold bars and discs and other precious cargo. She sank with 265 people onboard. We saw priceless artifacts from the Atocha, discovered in 1985, as well as the Santa Margarita, located in 1980. Other interesting exhibits featured Spanish coins of the Americas, the Real Pirates of the Caribbean, and the Science of Shipwrecks. It’s a fascinating museum to visit. During the late afternoon, Jeff and I decided to go on a guided waverunner tour with Barefoot Billy’s around Key West. For $129, our guided sunset tour circumvented the island. We began at the Westin Resort & Marina on our 28-mile, two-hour tour. We piloted our own Yamaha Waverunners as we started in the Gulf Of Mexico. We made multiple stops where we learned about island and its marine life. We passed the Southernmost Point, Historic Key West Bight, and Sunset Key. Probably the highlight was going full throttle at the convergence between the Gulf of Mexico and Atlantic. It was a rush jumping over the bump waves at high speed. At the end of the tour, we even had about 10 minutes to play around and freestyle with our toys at full throttle. After returning our waverunners to the marina, Jeff and I walked by the Shrimpboat Sound Studio. After going back to the hotel to get cleaned up, we returned to Duvall Street for dinner. It was packed on this weekend so we decided to go to the Key West Bight (harbor). Jeff and I decided to have shrimp for dinner at the Conch Republic Seafood Company. They also had good live music and a nice bar. 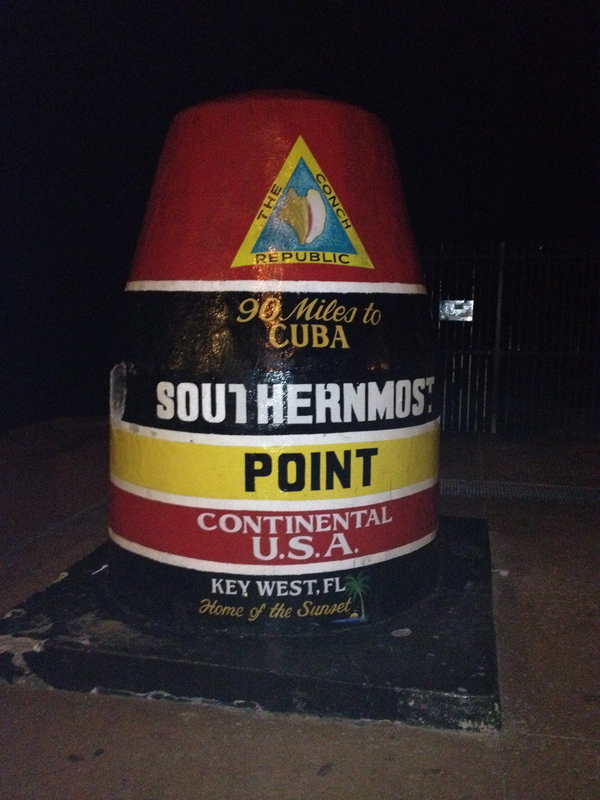 For our last stop, we drove to the Key West southernmost point marker. This is the end of the road in the continental United States and the mostly southerly point. The marker proclaims that its only 90 miles from Cuba, which is closer than Miami. Then we returned to the Key West Doubletree Grand Key Resort for a good night’s sleep.